Most avid golfers pride themselves on knowing the Rules of Golf, yet many times golfers have a different interpretation of the Rules and how to handle a specific situation. Ron Kaspriske at GolfDigest.com shares a list of the 10 Most Misunderstood Rules and the correct ruling behind these myths. 1. MYTH: A golfer who is off the green must play a shot before a golfer who is on the green. FACT: The player farthest from the hole, regardless of position, is always entitled to play first. So if a golfer has 50-foot putt while another golfer is facing a 5-yard chip, the golfer on the green is entitled to play first. Note, there is no penalty for playing out of order. However, in match play, you can be made to replay your shot by your opponent if you don’t wait your turn. 2. MYTH: A ball that is touched and falls off the tee after it has been addressed counts as a stroke. FACT: In most cases, it doesn’t count as a stroke and the ball should be re-teed without penalty. It counts as a stroke if the ball already was in play (if you whiffed on your first attempt, for example), or if you were making a stroke at the time the ball fell off the tee. 3. MYTH: In a scramble or other team format, you can stand on or close to an extension of your partner’s line of putt while he makes a stroke. FACT: No one on your side, including caddies, can intentionally stand on or close to an extension of the line of putt during a stroke. Intentionally is the key word. If someone on your side was standing there inadvertently, there would be no penalty. 4. MYTH: If you hit a ball into a water hazard, you can hit a provisional ball before going to search for the original. FACT: If you’re virtually certain your ball is in a water hazard, you can’t hit a provisional. The next shot you hit is considered a ball in play (plus add a penalty stroke). If you hit a ball in a hazard, proceed under options for Rule 26. If you think your ball could possibly be outside the hazard, then you can hit the provisional. But if it turns out that your ball is in the hazard, you must abandon the provisional. 5. MYTH: If you hit a ball in a water hazard marked with yellow stakes or lines, you can always drop within two club-lengths of where the ball last crossed the hazard’s boundary. 1. Play it as it lies. 2. Replay from the previous position. 3. Drop a ball outside the hazard behind the point where the ball last entered it, keeping that point directly between the hole and the spot on which the ball is dropped. There is no limit how far behind that point you can drop. 6. MYTH: If your ball is unplayable, you’re entitled to a drop in a spot that gives you a “playable” lie. 1. Replay the previous shot. 2. Drop a ball behind the point where the ball lay, keeping that point directly between the hole and the spot on which the ball is dropped, with no limit how far behind that point the ball may be dropped. 3. Drop within two club-lengths of the spot where the ball lay, no closer to the hole. Keep in mind that none of these options guarantee that you’ll be able to play from an unfettered position. 7. MYTH: You can either remove an out-of-bounds stake, or take relief from it or any fence/wall marking the course’s boundary. FACT: You do not get relief from anything marking the course’s boundary. Play the ball as it lies or take an unplayable lie and proceed under those options (see previous myth/fact). 8. MYTH: You can’t have a ball marked off the green unless it interferes with your ball, stance or swing. FACT: If you think another ball might interfere with your play of a hole, you can request it be marked and lifted. Note: A ball marked in this instance CAN’T be cleaned unless it’s on the putting green. 9. MYTH: If you can’t find your ball, you can go back to the tee and play a provisional ball. FACT: A provisional must be played before you go up to look for your ball. If you go back and play another ball, your original is lost. 10. MYTH: When your ball, stance or swing is interfered with by a cart path (immovable obstruction), you always take relief on the side farthest away from the hole. 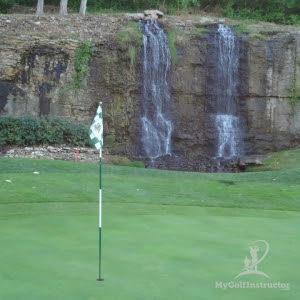 FACT: You have to locate the nearest spot off the cart path that allows you to stand and swing without interference and is not nearer the hole than the ball’s location. That spot could be on either side of the cart path depending on your ball’s position and the stroke you intend to make for your next shot. Once you determine where that spot is, you’re allowed to drop within one club-length of that spot, no closer to the hole. Visit USGA.org for more answers to your Rules of Golf questions. Our series, Golf Myths DEBUNKED, *finally* puts an end to those longstanding debates you and your buddies can’t settle when it comes to fact vs. fiction in golf. We periodically shed light on five myths that have commonly, and incorrectly, become the standard for most of the golfing world. In Chapter 1, we covered various topics that many golfers think are truths within the game. And, as we unveiled after a little fact-checking, myth vs. reality turned out to be drastically different. We’re back with Chapter 2 to explore five commonly misunderstood golf rules that can be confusing for many. So read on, get enlightened, and share with a friend who could use this information! Out of Bounds: If your shot comes to rest on the wrong side of the white stakes, you’re required to play another from the same spot under the penalty of Stroke and Distance. It’s commonly thought an O.B. ball incurs a two-stroke penalty, which, in essence it does. But think of it as a one-shot penalty plus another stroke played from where you just hit. This replayed shot basically erases any “distance” the O.B. shot may have gained, thus taking the essence of a two-stroke penalty. Also, whether you know your shot went O.B. or just think it could be, USGA Rule 27 calls for declaring a Provisional Ball. This is the name for your do-over effort. The provisional becomes in play if the original shot is deemed out of bounds, and disregarded if it’s in. Either way, you should always hit a provisional before leaving the area to keep up speed of play. Ball Lost: Similar to the out-of-bounds ball, it’s wise to hit a provisional anytime there’s a chance you may not find it. USGA Rule 27 also states you have 5 minutes to identify your ball once you start searching. If the ball is not found, your provisional is in play under the same stroke-and-distance penalty as the O.B. ball. What YOU do: OK, maybe you don’t do this, but someone you know does. What we’re talking about is flailing one O.B. or into the woods, and then dropping the ball – taking only a one-stroke penalty – in an area near where it entered Troubleville. This unofficial amendment of the rule not only creates an arbitrary dropping point, but virtually eliminates the “distance” part of intended penalty and saves a shot from your score. PSA: Now that you know this, if you – sorry, your “buddies” – still don’t hit provisionals and drop per the usual with O.B. and lost balls, at least add TWO onto your score to more accurately reflect. *Check out THIS video from the USGA for more information on out-of-bounds and lost ball procedures. No, you cannot drop the ball on whichever side of the path gives the best shot to the green on your next. Yes, you are guilty of this at one time or another. USGA Rule 24-2 basically explains that free relief is given from immovable obstructions, which are artificial objects like cart paths, sprinkler heads, signs, etc. But most golfers already know that. The real fun happens in many players’ adaptations of the rule regarding where they take their relief. So, yes, this means that, sometimes, the open and inviting fairway on one side of the path with a clear shot to the green is NOT where you’re allowed to drop. The only entitled relief may instead be on that other side of the path, which isn’t as favorable to your cause. *Check out THIS video from the USGA for more information about relief situations. Yellow stakes indicate a Water Hazard, which is generally an obstacle the hole’s intended design requires you to carry. Red stakes indicate Lateral Water Hazard, which is more auxiliary to the hole (hence, “lateral”) and often take the form of creeks or lakes/marshy areas on the sides of the fairway. When your ball comes to rest within a yellow-staked area, you have three options to proceed. When in a red-staked area, you have five. Still a little murky on water hazards? You’re not alone. Even at the game’s highest level – most famously so with Tiger Woods at the 2013 Masters as shown below in the Associated Press’ recap of his controversy on No. 15 – the correct procedures surrounding water hazards still cause confusion. *Check out THIS video from the USGA for more information about water hazards. 4. Does a golfer playing from off of the green always hit first, regardless if his or her playing partner on the green is farther away? No. Here’s USGA Rule 10 if you want to dig into it, but long story short, whichever golfer is farthest away from the hole plays first. It doesn’t matter whether he or she is on the putting surface or not. The only thing you really need to remember, though, has to do with speeding up play. Or, basically this: The golfer who is ready to play first, should always play first! *Check out THIS resource from the USGA about for more information about order of play. Let’s refer back to TW in 2013. Notice his form below – arm extended, ball dropped from shoulder height straight down with no added force or intention, an anxious look from caddie, Joe LaCava, who was likely wondering if his player’s drop and ensuing shots would lead to another Masters title (it didn’t) – yes, even though the subject of where Tiger dropped the ball was in question, his form doing so was perfect. Tiger Woods’ controversial drop on No. 15 at the 2013 Masters (image via the Associated Press video above). USGA Rule 20 covers the full monty on dropping a golf ball, but if you just want to know the basics, copy Tiger’s form as shown above. *Check out THIS resource from the USGA for more information about how to properly drop a golf ball. The historical principles and ethos of the game, the need for the Rules to remain clear, comprehensive, appropriate and relevant, and the importance of ensuring that golf is played with integrity and in accordance with etiquette. The reality in golf is that the majority who play it (somewhat) strive to follow the rules. But, aside from competitive golf, where rules are followed to the letter, many golfers incorporate a relaxed, generalized version of the rules when they play. And that’s OK. Golf should, and NEEDS, to remain fun at all costs. Because, considering the complex nature of golf’s rules, it can be tough (and too slow) for John Q Golfer to follow all of them as fully intended. Regardless, it’s good to know the rules of golf whether you choose to abide by them or not. No matter the case, though, (and regardless of your stance on the complicated nature of golf’s rules, which has become politicized), we should all play golf how it best suits each one of us, and our enjoyment of the game. Because – again – golf should, and NEEDS, to remain fun at all costs.